Yes, it’s the great and wonderful A to Z Challenge Theme Reveal day, when those who can’t resist a theme tell you all about it, and you nip round to all those who are exposing themselves their theme to the world. Everyone here has of course signed up for the A to Z Challenge, which you can too – just click here. Be careful if you’re going to a blog marked (AC) as that means Adult Content, and that might be too revealing. Before I reveal all, I’d like to thank everyone who voted for The Perihelix in Cover Wars last week on AuthorShout.com. We came third with 12.57% of the total votes, and the winner was The Many-Colored Invisible Hats of Brenda-Louise by Annie Daylon who got 36.57% of the votes cast (and it was a brilliant cover!). I can’t imagine that you haven’t already spotted my theme if you’re a regular reader, but of course, you might be here for the first time, wondering who is this ‘Jemima Pett, Author’, and the big question – will you add her to your list of people to visit during April? Providing the world’s environmental services. 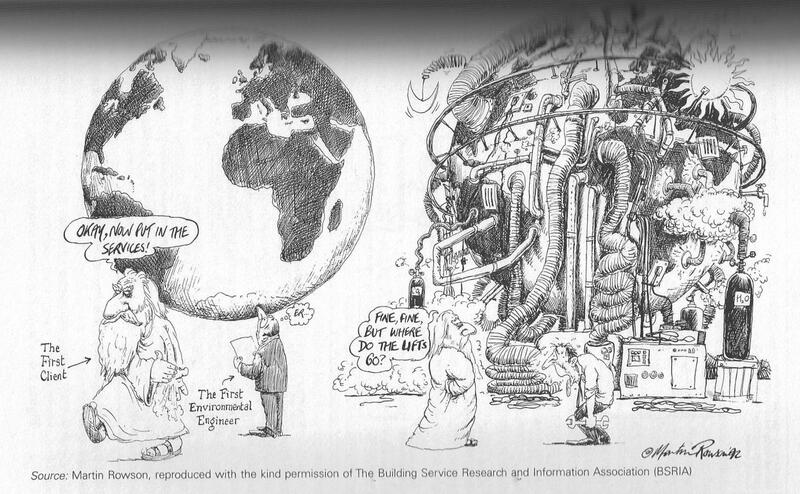 Cartoon by Martin Rowson c 1994, from Greening the Built Environment (Smith, Whitelegg & Williams) Picture accredited to BSRIA. Apologies for the scan quality. I’ll be looking at some of the amazing worlds created by people in fiction, including a number of my own. In fact, the reason I picked the theme is to help myself develop a few more worlds for my Viridian System series, the first of which, The Perihelix, is out now and only 99c till the end of March. So buy the Perihelix today! All the links are in the right side bar. I’m also doing some interviews with other world-builders, reviewing books on Saturdays that include awesome worlds, and squeezing in some new flash fiction too. If I’ve got time, I’d like to add some illustrations, but I can’t start doing those till I’ve set up all the posts, which means finishing the books I’m reviewing… and so on. So please – add me to your list of people to visit, or follow me on Twitter, Facebook, Pinterest or Goodreads using the buttons on the left or widgets on the right…. clowns to the left of me, jokers to the right, here I am (watch out for all those with a music theme 😉 . And I’ll be doing a giveaway during the month which you can enter every day, too. So come back April 1st – I’ll be here, with my #FridayFlash fiction starring a planet beginning with A! Now go and see some of the other people revealing all today (link to theme reveal sign-up). That is quite an interesting and different topic. I love the idea of new words. All the best for the challenge. I hope you read that right and perhaps made a typo, Indy – it’s world, not word! Mind you, mind word of the day feed from the Oxford English Dictionary gives me lots of ideas for language changes in my world! Sorry you didn’t make first place Jemima. Very best of luck with the A-Z. Wow, you’re going to be busy in April and in the run up, by the looks of it. I wish you luck. Your world building theme sounds great and you’re clearly putting so much effort into it. See you in April. Great theme choice. I’m always eager to learn new ideas and look forward to your posts on world building. World building is always such an intersting heme. So much to share about it. Thanks, Jazz! I’m looking forward to your theme, too! Thanks, Sophie – see you too! Thanks, Anna – have a great time this year! Yes, one of those classic ideas that sounded… easier than I made it! Good theme choice! As you know, I’m not doing A to Z, but I’ll be visiting lots of folks, I hope! In May, when I say ‘next year I won’t do it’… remind me, eh? Good luck with the challenge! I’m sitting it out this year, but should – in theory – have more time for visiting. Yes, that’s what I was going to do – until I had an idea that wouldn’t lie down! Ooooh, sounds interesting! I love when authors build awesome, elaborate worlds. Happy blogging! Yes, I must admit that some of the examples make me think I should stop trying to be what I’m not – but then I write an IWSG post and feel better! World building sounds just fascinating. A very apt theme from an author. And giveaways are great! Have a great A-Z! Intersting. I don’t know much about world building, as so far I have only one book and it’s non-fiction. But the world of your blog is awesome, Rhonda! My daughter loves world building. What a great theme. 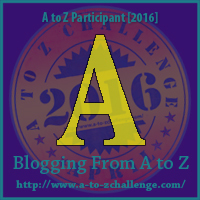 I’m looking forward to the a-z challenge and can’t wait to read some of your posts. Thank you! I haven’t got to your blog yet – but I’ll be there! This will be a great read for me next month. I have recently discovered that deciding my setting for my stories is a leading factor in what inspires me to see a story through! Ah, yes. I think I always have a sense of the space they’re in before I get the characters. One of my interviewed authors says something about that, I think! Wow! This will be an interesting topic! Can’t wait to see what you all come up with! Thanks, Shilpa, and good luck with your Hooliganing! World building is not my strong suit, so I will be back! I love world building and did it as my theme two years ago. I’ll be back, to quote a famous person other than the Ninja Captain. Oh gosh – I didn’t remember that! But then, there are so many wonderful blogs out there. I wonder whether we’re covering the same ground – at least for the most difficult letters? World building! I love it 🙂 I can spend ages on world building, and reading others’ thoughts about worlds… I am looking forward to reading your posts! Some are more vivid than others 🙂 Thanks, Debbie! I always marvel at fantasy writers who can create a fantastic world “from scratch” and come up with amazing names/new language/rules etc. for this world. Sci-fi writers too! Looking forward to your theme too, Michelle. My books are at your service! Interesting topic! I’ve always struggled with fantasy and sci-fi, but I do try to keep an open mind and I keep trying to get into it. I’m looking forward to reading your posts. What a fabulous theme – can’t wait to catch your posts! Thanks, JE – only 8 more days to go! Oh that’s a very cool theme and it will be useful for me. Just signed up and looking forward to your posts! Thanks, Rian. Have a great time! Oh, fun topic! I think my favorite world building author is Ursula K. Le Guin. I adore Left Hand of Darkness. I’ll be interested to see what you come up with. I really must read it again. I know I loved it – but never reread it, and it’s one of those I’ll probably remember as soon as I open it. I know I never got around to the Earthsea trilogy – which I nearly bought the other day. That’s definitely on my TBR list. Oh, I can’t wait! Thank you for visiting me. I think you’re right, your worlds are going to pair up nicely with my ‘people’! What an awesome theme! I will definitely be looking forward to this, Jemima! Great theme! World building is something I have never attempted, so I am interested to hear more about it. One of the best things about having a theme is how much more you learn about something you thought you knew about! That is so interesting! look forward to reading you in April! Thanks, Princess – yours too! Sounds interesting. I’ll be back to check out what you post. World building is tricky, so good on you for tackling it for A-Z. Well, I have to do it, so it’s good for me, Sabina! Very interesting theme, Jemima. I look forward to learning about world building. Already very curious about it, as it sounds like something right up my alley. Love learning.